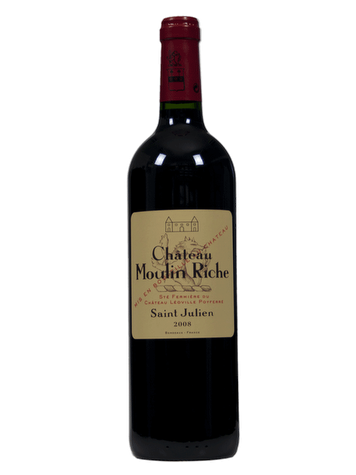 Its dark garnet color offers a pretty nose of roasted red fruits and cherry. As for the taste, this wine is balanced typed, round and nervous with a nice lie on tight tannins that blend. Beautiful alternative to prestigious great growths of Bordeaux, the second wines promise feats of great vintage years. From the youngest of large plots Bordeaux chateaux, they live on the same land and benefit from a unique expertise in viticulture and winemaking. Classified Cru Bourgeois Exceptional in 1932, this castle of the nineteenth century is located in the town of Saint-Julien. It was acquired at the same time as the castle Léoville-Poyferré by the Cuvelier family in 1920. The mark was used as a second wine for several years. It was not until 2009 that the castle Moulin Riche assumed as a full castle. Terroir: This area of 21 hectares is located on a typical Médoc soil composed of gravel, sand and clay. Viticulture: Since 1994, the harvest is done manually. Vinification: The wine is aged in barrels for a period of 18-20 months.